I love it because all the blue-chip galleries are right next door. If I want, I can go in my pajamas to the Gagosian or Pace. Hunter O’Hanian: Hello everyone, I’m Hunter O’Hanian and I’m the Director of the College Art Association, and I’m here today to chat with Lev Manovich. Hello Lev. How are you? Hunter O’Hanian: Yeah. Nice to see you. Thank you for welcoming us to your home here in Chelsea, in New York. Hunter O’Hanian: Well, it’s great to be here. It’s great to be out on the roof of your house and how long have you lived in this neighborhood in New York? Lev Manovich: Before I was a professor in the art department of University of California, San Diego, between 1996-2013 when I was offered the job as a professor for the Graduate Center CUNY, I rented this place and I love it because all the blue-chip galleries are right next door. If I want, I can go in my pajamas to the Gagosian or Pace. Hunter O’Hanian: How great that you just get to go out in your pajamas and go to Pace, or Gagosian or wherever. Okay, so you got your PhD from the University of Rochester. You got your MA from NYU, you got your BA from there as well, too. What I think is really interesting is that you have degree from the Moscow Institute of Architecture that you got in 1977 and ‘79. In addition, you’ve won many awards including the Mellon Fellowship in Art Criticism, you won a Guggenheim in 2003. Let’s circle back to your time in Moscow. What was that like? When you were there, Leonid Brezhnev was the head of the Soviet Union. What was that like as a young scholar? Lev Manovich: When I left in the early ‘80s, I was 21. I wasn’t a scholar yet. So, I didn’t get to finish with the Institute. I would have spent two more years. I grew up in the ‘70s, which was the final phase of the Soviet Union and the whole Communist system, and looking back I am so, so glad that I grew up out of this crazy different planet. Because here, when you come to the States, especially at that time, everything was so different. I think this experience of growing up there is completely responsible for my whole career. Because I think when I look at contemporary, let’s say culture, since that time, because of … and capitalism, and that really became dominant worldwide, I have my alien perspective. I think it helps me to see things in very strange ways. Another thing, which, of course, I miss a lot … during the time everything was forbidden, people published things in Samizdat, you couldn’t buy foreign books in bookstores, but people were still able to do independent culture. People would have exhibitions of art in their apartment. Somebody would call you and say, “Go to this apartment,” and the exhibition would last five hours. Because everything was forbidden, when people were able to do something like this, you knew when to go to them, everybody just felt so excited. Lev Manovich: Whereas today, I think we have abundance of information, opportunities, exhibitions…. There are so many galleries in New York. There are hundreds of art being noticed. You can follow any artist online and I am always surprised with my students who don’t take advantage of it. Because, for me, growing up in a country where there was information hunger. I love internet. I love Instagram. Basically, what I do before I go to sleep, I read Wikipedia. With abundance of information, the fact that I can find out about so many things and I can also see what artists are creating in tens of thousands of cities around the world, from my computer, it’s absolutely amazing. Hunter O’Hanian: That’s wonderful. You’re now a professor to Graduate Center CUNY and you’re the Director of the Cultural Analytics Lab, which was founded in 2008. From what I’ve read, you developed the concept of cultural analytics in 2005. Tell us, what is cultural analytics? Lev Manovich: In the middle of 2000s, this new term “digital humanities” started to become more and more popular, and in this decade it has really been very widely discussed in my Academy. Just as today, at the time, people were starting to use computational tools to analyze, let’s say culture. Not looking at certain novels, but ten thousand novels, and there is a cultural scale…. The focus of this work has largely been literature. When I saw it I said, “Well, we kind of need a different term to indicate, but we also want to apply these methods to study the history of culture, the history of art, history of visual media, and also contemporary media, whether it is web design, Instagram, photography.” I come up with a term and today there are hundreds of others’ papers, where people analyze, for example, social media or visual social media with papers done by people in Computer Science, Computational Social Science, Visual Anthropology, Visual History, and also recently merging to field of paradigm of visual history. I think what I started was, really, just a few papers and now I can use this term more like an umbrella to describe this research, which includes not only publications in academic journals, but also art projects, exhibitions, software people share online. Today research, the research outputs or research tools, also includes software data sets. Let’s say Google has this amazing cultural institute and curate these beautiful exhibitions of images. It’s also very cultural analytics. I would say its use of computation, not always to analyze. It’s a visual media or artistic media, but also to teach it and also to create new interfaces for interactive media. Hunter O’Hanian: One of the research questions that you pose in the lab is, “How can we observe giant cultural universes of both user-generated and professional media content created today without reducing them to averages, outliers, or preexisting categories?” How has your research developed in that area? Lev Manovich: I think when I started, I was so fascinated with within a couple of years, the number of cultural producers and visual artifacts re-created, exploded a universe that grew after The Big Bang, so to speak. Let’s say, before, people were writing about Italian Renaissance or 1940s Hollywood cinema. Basically, we have a limited number of artifacts, limited number of artists, and you can kind of observe it, in a way, with your own eyes. In 2005, when people started sharing things on Flickr and on YouTube, and Instagram and Twitter and so on. Today, people are sharing over two billion images per day. Hunter O’Hanian: That’s amazing. Two billion a day. Lev Manovich: Yeah. It’s growing. For me, Cultural Analytics is basically about questioning everything we know, so using that challenge of big data to question what we know. I said, “What I actually want to do is not necessarily statistics but visualization, I want to sample this universe. I want to bring thousands or millions of images before my eyes.” Even I, myself, am going to see all kinds of interesting patterns, which perhaps don’t fit in these categories. It is really about observing in a very precise way. You can also connect it to workings of our history, Heinrich Wölfflin… created this new method, which our historians use throughout the century in comparing images on two slides. How you can compare billions of images? I see Cultural Analytics, in a way as an extension of comparative methods in humanities. Hunter O’Hanian: You also look in the lab about how you use data to measure diversity, variability, differences in temporal changes in these cultural data sets. What are some conclusions you’ve drawn from that as well? Lev Manovich: We look at everything from cartoons, films, TV series, posters, book pages, Time magazine covers, one million Manga pages, one million artworks from DeviantArt, 50 million Instagram photos. I said, “So these are all very different types of visual culture.” If I’m to develop some methodology, which I can teach to students, in general, right, what we should look at? For example, if we look at visual art, we talk about topics, style, et cetera. If we’re looking at literature, we can look into other things. Abstract from these media-specific categories, what else? I said, “Well, we could talk about how certain point of culture developed over time and we use computers that allow us to see, keep track of these changes. We can take different data sets and compare them.” For example, I want to compare a million paintings done in Brooklyn versus a million paintings done, I don’t know, in 798 in Beijing, but how do you compare those on a scale? When we can think about our ability … so you say, “Okay, there is a particular genre of selfie.” There are millions of selfies, which are very close or very far from the genre, so you think of a particular genre or a particular idiom. All right? Let’s say 19th century still life. When you consider it all works in terms of how close to the center it all is and finally because of diversity. We talk about the ability, it’s like statistics, right? How far a particular data point from average. With the ability, it’s more like ecology: how many different species of animals have you observed in this forest? It’s not about throwing away categories, it’s gaining more categories. The way people do it in science, so biologists describe life on the earth, same with a hundred million species and be able to deal with it. What if I start dealing with 10,000 species of images? Why not, right? Basically, we’re bringing our reflection about using visual culture, a bit up to date to what is used. Actually, I will tell you, people able to look at things the more precise way, uniquely with distinctions. For me, cultural analytics is about questioning everything we already know. Hunter O’Hanian: Of course, using social media and a lot of the stuff that you do today, it’s great that you’re able to mix fine art and popular culture at the same time and the culture around everybody and bringing that in as to what their lives are about and you’re mixing those two things when you look at it. Lev Manovich: Well, I think it connects to another point, which we talked about right before we started. Today we have four billion mobile subscriptions. Not all of them are smartphones but there’s at least one billion people which have smartphones and they come with all this free software. Not only with, let’s say, again, but over 200 apps to aid images. Let’s say when I started doing digital art 30 years ago, you can put all the people who did digital art in one room. Then, let’s say, 20 years ago you could put them all … maybe 300 people. Now, we have a billion people. The way we have one billion artists and one billion photographers and if you look closely you can find all kinds of things. You find things which are maybe very, let’s say, something or something will give a copy for somebody else, but you also find lots of diversity. What I want to do is I want to expose this diversity because I think, ultimately, if you’re to collect enough of a sample of contemporary art, perhaps you may find more diversity on social media because contemporary art you also have certain fashions, certain waves. Today we’ll have this in fashion, tomorrow … so we have this idea which comes from that … with art as something special, it’s a romantic, it’s the best of humanity, but today you don’t need to go to art school or design school to be artist and you can basically have viewers of your work on social media. Hunter O’Hanian: Sure, and it creates an audience. Lev Manovich: Yeah, so I think intellectuals tend to dismiss it as something trivial, something banal, well, that’s not being intellectual. We want to take it seriously. Hunter O’Hanian: Yeah, no, that’s good. You brought Instagram up a few times. How many followers do you have on Instagram? Lev Manovich: Basically, last year I was writing this book about Instagram. I would observe something, write a chapter, I have those chapters on my website. When I do this research over about three years, I basically figure out some principles, whether it has to do with how many followers, but there are also thousands of articles about it. My case, I didn’t follow those rules, so I only have a couple thousand followers. On Twitter, I also read about … I read, for example, research that says if you want to be retweeted, you have be between 110, 140 characters. I follow statistics even … to Tweet, so Twitter I follow all the rules so I have over 20,000. Lev Manovich: I follow the rules, but then of course, limited to what you can say. Hunter O’Hanian: Sure. Obviously you’re coming into contact with a lot of students these days and a lot of people who are either art makers or scholars or thinking about digital media. What kind of advice do you have for people entering the art world, whether they’re creative or whether they’re writing, what would you tell them? Lev Manovich: Well, I hope people are not entering the art world, I hope they’re entering the cultural world. 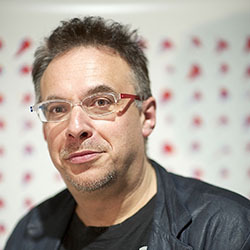 Lev Manovich: The art world is just a very small part of it. To be honest, I don’t know a single person which takes the contemporary art world seriously. Lev Manovich: Yeah, because again, in my view, fields like design, science and food are more interesting, but that’s my opinion. To be an artist in the art world, it’s not the only choice anymore. I think with people who are young, I would say there are two reasons why I would recommend people to learn computer programming and a bit about data. First of all, this is a world believer. Production analysis, algorithms based on data are central to the contemporary world, as electricity was central to the … century, as steam engines were central to industrial world of 1820. If you simply want to understand the world in which you live, but why will Facebook … how does the navigation system in my car work? You should basically have some computer literacy, data literacy, and should learn something about algorithms, basic programming, how to make a webpage, analyze data, give statistics. Otherwise, I don’t know if you can say very relevant things about the world today. Maybe artists’ or historians’ culture. The second thing, I think, for professional advancement, so the digital humanities started in early 2000s, in the last five or six years you see many, many jobs where people want somebody who does 19th-Century novel or 18th-Century theater plus, plus, plus, plus digital humanities. In this decade and for the next decade, this is something which actually would help you to get a job because the new thing—everybody wants it and most people don’t do it. Simply from this very practical point of view, our digital art history is something that should exist or something that’s probably started to around 2012. It’s very new. It will get bigger the way it happened in English or in literature, so I think if you’re entering the history, (1) it’s too young. Take some online class, learn a bit of programming, and also learn about things which are specific to art history, how the computer looks at images. Learn about computer vision. Because regardless of whether you’re using it in your work, in five years when you’re interviewing people will be asking, Do you know that?” You still will be doing it. Again, it’s not about giving up the mind, it’s not about giving up theory. It’s not about giving up analytical thinking, but it’s simply adding contemporary methods to the methods inherited over the last 300 years. Hunter O’Hanian: You’ve been to many CAA conferences and it’s been great that you’ve spoken. I hope you get to come to another one. Our next one will be in Los Angeles in February 2018, so I hope you can come to that one as well. Lev Manovich: I appreciate it very much. The first time I was at CAA, I was still a student. It was in 1990, it was in Seattle. I actually met a couple people who became my best friends. Hunter O’Hanian: Fabulous, I love that. Lev Manovich: I’m very lucky that now I’m in New York. It stays in New York every other year, so I always come. I’m on the panels. People have to realize, it’s amazing that CAA exists because in most countries you don’t have anything like this. You maybe only have 200 art historians in Switzerland or we don’t have this organization. The fact that this is organization, you bring us together, we’re at conferences, job placement, there are all kinds of things you can develop. Yeah, maybe we always complain that every organization is bureaucratic but it’s fantastic that CAA exists. I wish you guys all the luck, and I think we all should support it and it’s up to us if we don’t say something, it’s up to us to put it there. This interview, it’s fantastic, an interesting project, it also makes it more visual and more interactive. Lev Manovich: Thank you so much. Hunter O’Hanian: Thank you for this great view and for inviting us to your roof here. It’s really great. Lev Manovich: Come anytime. We’ll drink some beers. Hunter O’Hanian: Okay, thank you. I appreciate it.